The online fire extinguishers training course will guide you through all aspects of fire extinguishers types and operations. You will learn how to safely operate a fire extinguisher, understand what types of extinguishers can be used on what types of fires, as well as their maintenance requirements. The course will also instruct you in fire prevention and safety. 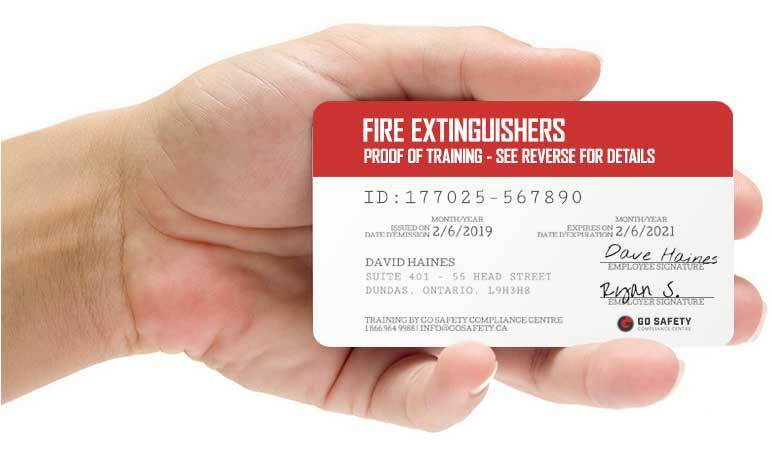 By completing the fire extinguisher training you can become a better-educated worker and improve your knowledge of an important part in workplace safety. Michael P Verified Buyer Convenient, thorough and a great way to train staff. Ciaran M. Verified Buyer Course was well designed and very informative!!! John C. Verified Buyer Great online course. Along with excellent online help. Ellie L. Verified Buyer Very good experience from enrolling to course completion. Laszlo S. Verified Buyer The delivery of the training was very good; structured and easy to follow. The on-line training will make it easier for our company to stay updated. Training can be completed two to two and a half hours. Work at your own pace with no time limit. A sturdy plastic Fire Extinguisher wallet card may also be ordered directly from your Go Safety account for an additional fee. These hard-copy certificates are printed on durable 0.30mm polycarbonate plastic. WHO SHOULD TAKE FIRE EXTINGUISHER TRAINING? Go Safety’s Fire Extinguisher Training is a useful general knowledge course for anyone regardless of industry. You never know when a fire can happen, be it in the kitchen or on the shop floor. It’s useful and reassuring to know your people are proficient in the operation of fire extinguishers and knowledgeable about fire safety. 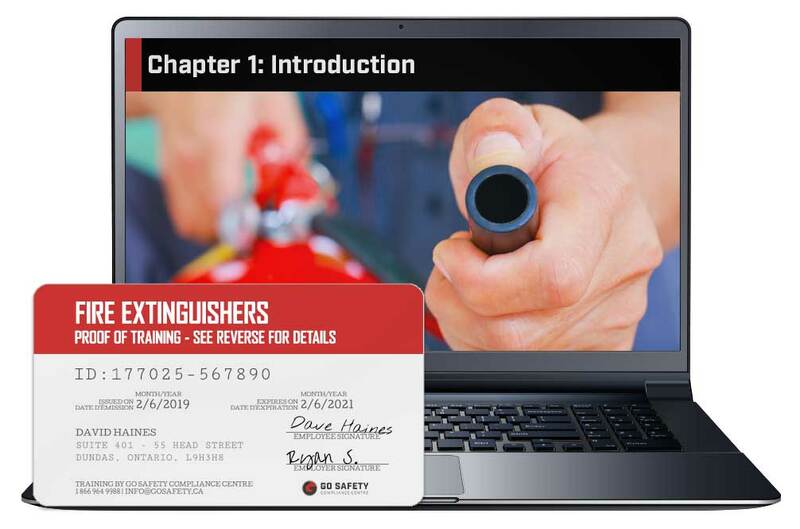 WHAT TOPICS ARE COVERED IN THIS FIRE EXTINGUISHER TRAINING COURSE? Understand the meaning of ‘Fire Triangle’. Recognize the different types of fire extinguishers and how to maintain them. Know the different classes of fires and which fire extinguisher to use. Understand how to prevent fires from starting and spreading. WILL I REQUIRE ANY ADDITIONAL TRAINING? That depends on your job. Your employer is responsible for ensuring that you are fully trained in the safety procedures required for your employment. This may include additional practical training in evacuation procedures, first aid, or personal protective equipment. Be sure to check with your employer to ensure that you are fully trained and ready to begin work. HOW LONG WILL IT TAKE FOR ME TO COMPLETE THE FIRE EXTINGUISHER TRAINING COURSE? Most students complete the course in about two hours, but there is no time limit to finish your training. You can pause the program and pick up where you left off later. Take as long as you need. Once completed, the training material will continue to be accessible to you for review purposes. You can write the exam multiple times until you achieve the passing grade of 80%. WILL THE ONLINE FIRE EXTINGUISHER TRAINING COURSE WORK ON MY TABLET OR SMARTPHONE? HOW CAN I ACCESS MY FIRE EXTINGUISHER RECORD OF TRAINING? WHAT HAPPENS IF I LOSE MY FIRE EXTINGUISHER TRAINING CERTIFICATE? CAN I PURCHASE THE FIRE EXTINGUISHER TRAINING COURSE FOR SOMEONE ELSE?